Designed to stand out, Honors represents an aesthetic blend of classic timelessness along with contemporary style and boldness. With standards above and beyond our strongest competitors, the Honors line is milled, finished and assembled to the highest quality specifications in the industry. This frame offers the option of three different glass types: Non-UV Protection, UV Protection, and Museum Glass on a black mat. Dimensions: 16½ x 19. 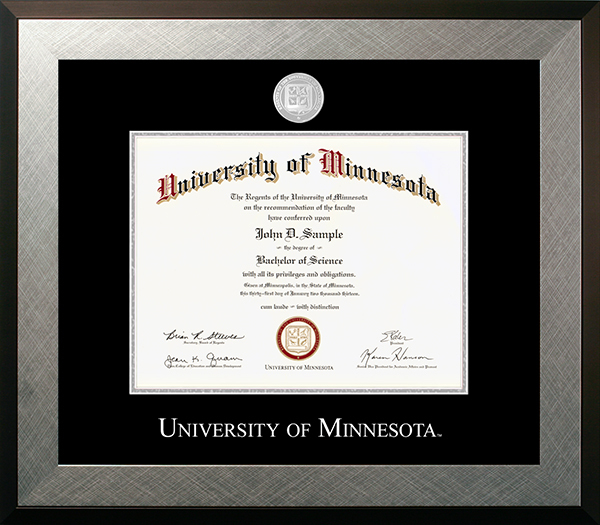 Fits an 8½ x 11 diploma. Custom Matting options are available. Please contact the Bookstore for more information. Custom glass configuration ships in 7-14 business days. Note: Custom configured orders will be billed prior to shipment and cannot be returned. Available for purchase, will process in 1-3 business days.